Novus Ordo Chronicles: Bishop in Bolivia prohibits communion in the hand in his diocese. Our partners at Adelante la Fe / Rorate Caeli en Espanol report that the Bishop of the Diocese of Oruro, Bolivia declared this past Sunday that he will no longer permit communion in the hand (EXCLUSIVA: El Obispo de Oruro prohíbe la comunión en la mano en su diócesis). The report says that the Bishop, the Polish Verbite missionary Krzysztof (Cristobal) Białasik, made this decision after it was noticed that some people receive the Host but do not consume it, apparently wishing to carry It away for unknown reasons. Bishop Białasik is 57 years old and was appointed Bishop of Oruro by Pope Benedict XVI on June 30, 2005; he was consecrated in September of that same year. 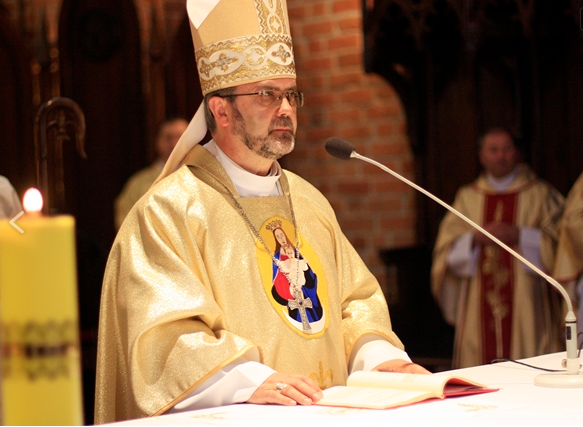 To our knowledge, Bishop Białasik is only the third bishop in the last ten years or so to withdraw permission for communion in the hand in his diocese (as opposed to maintaining an existing prohibition, or simply recommending communion in the tongue for the faithful in their diocese, or forbidding communion in the hand only in specific churches). The first was Juan Luis Cardinal Cipriani of Lima, Peru in 2008 (reiterated in 2011 at least for large celebrations) followed by Malcolm Cardinal Ranjith of Colombo, Sri Lanka in 2011 (reiterated in 2012). A fourth bishop, the recently-deceased Rogelio Livieres (may he rest in peace), strongly condemned communion in the hand in August 2014, in one of his last acts as Bishop of Ciudad de Este. Perhaps he would have prohibited it altogether had he not been ousted from his See soon after. (He already issued a letter on the liturgy in 2013 that recommended to his faithful the reception of communion kneeling and on the tongue, but did not prohibit the opposite practices.) Finally, the Catholic Bishops' Conference of Nigeria temporarily permitted communion in the hand in July last year (at the height of the Ebola scare) then quickly withdrew the permission (in December) once the scare had passed. A handful of other diocesan bishops have taken measures to require communion on the tongue in some circumstances. These include: Bishop Antonio Carlos Rossi Keller of Frederico Westphalen, Brazil, who announced at the end of 2011 that those receiving communion from him at his cathedral should do so on the tongue while kneeling; Bishop Eduardo Maria Taussig of San Rafael, Argentina, who required the same thing from all communicants in his cathedral in that same year; and Carlo Cardinal Caffarra of Bologna who mandated in 2009 that in three major churches in his Archdiocese (Cathedral of St. Peter, the Basilica of San Petronio and the Shrine of the Madonna di San Luca) communion be distributed to the faithful on the tongue only. Naturally there was the example generally given by Pope Benedict XVI starting in Corpus Christi 2008, plus the widely reported (but frequently violated) requirement during his reign that for Papal Masses in St. Peter's Basilica communion was to be given only in the tongue. Last but not the least: this should be a good time to recall the achievement of the now-retired Bishop Juan Rodolfo Laise OFMCap who, in 1996, withstood enormous pressure to be the only diocesan bishop in Argentina to refuse to permit communion in the hand in his diocese (San Luis) when the indult for it was granted to his country. We are told that the diocese continues to maintain the prohibition. His actions thrust him into the limelight, leading him to write a book ("Communion in the Hand") and to speak at various conferences in defense of the reception of communion in the tongue. Traditional Catholics familiar with the situation in the late 1990's and early 2000's will recall that he also became a proponent and friend of the Traditional Latin Mass, which he offered on a number of occasions. In a sense, Bishop Athanasius Schneider is his successor as defender both of the traditional manner of receiving communion and of the Traditional Latin Mass.